A motorcycle accident can upend a motorcyclist’s life. It can cause traumatic personal injuries, permanent disabilities, and both physical and emotional scars. It may also lead to thousands of dollars in medical bills and lost wages. In 2017, 185 Pennsylvania motorcyclists lost their lives in traffic accidents. Thousands more suffered serious personal injuries. If you suffered injuries such as broken bones or a traumatic brain injury, or lost a loved one in a motorcycle accident, a qualified Philadelphia motorcycle accident attorney at Rosenbaum & Associates can help. Why Choose Us for Your Motorcycle Accident Claim? We have successfully settled and litigated personal injury and wrongful death claims in Pennsylvania for over 25 years. We have a staff of over 40 people for full case coverage. Lead attorney Jeff Rosenbaum maintains a close relationship with all his clients. We are dedicated to helping injured motorcycle accident victims. We promise to give personal care and attention to each case. We have secured millions of dollars for clients in insurance settlements and jury verdicts over the years. We operate on a contingency-fee basis. We only charge for our services if we secure a settlement or verdict for the client. Call (215) 569-0200 today to schedule a free consultation. A knowledgeable Philadelphia motorcycle accident attorney will review the specifics of your case and let you know what options you have for recovering compensation. Medical expenses. Payments for past and future hospitals stays, emergency care, surgeries, rehabilitation, therapies, medical devices, and prescriptions. Past and future pain and suffering. Compensation for the physical pain, emotional suffering, and mental duress the victim may have experienced because of the accident. Lost wages. An award to recover lost income and lost earning opportunities from a temporary or permanent injury. Property damages. Reimbursement for the expense of repairing a damaged motorcycle or replacing a totaled vehicle. A motorcycle accident injury claim’s value will depend on the severity of injuries, the amount of losses, the actions of the defendant, and many other factors. Reviewing our past case results at Rosenbaum & Associates can help give you an idea of the recoveries we can achieve. A statute of limitations is a law providing a time limit by which claimants must file their personal injury claims. Statutes of limitations differ from state to state. In Pennsylvania, injured motorcycle accident victims have two years from the date of their accidents to bring their claim against a negligent party. The courts will only overlook a missed statute of limitations in rare circumstances, so victims should try to act quickly. A wrongful death lawsuit has a limit of two years from the date of the individual’s death to file a claim. Pennsylvania is a choice car insurance state. This means drivers can choose whether to pay for fault or no-fault auto insurance. Fault insurance means you will not receive money for crash damages until you prove someone’s fault. No-fault insurance will give you benefits right away, but they may not be enough to cover your damages completely. You may only have the right to file a personal injury claim after a motorcycle accident with fault-based insurance, unless you suffered serious injuries. The state of Pennsylvania has over 850,000 licensed motorcyclists. With so many motorcyclists on the roads, safety is one of the state Department of Transportation (PennDOT)’s priorities. Many tips can help reduce the risk of a motorcyclist getting into an accident, but one of the best ways to stay safe is to obey the law. Both drivers and motorcyclists should obey applicable laws and rules to help prevent deadly collisions. Rules of the road. Motorcyclists have every right to the road other motorists have. They must also obey all traffic laws, rules, and regulations. Motorcyclists must obey posted speed limits and stop signs, and yield the right-of-way when applicable. They may ride two abreast of one another, but not with a motor vehicle. Motorcyclists cannot lane split in Pennsylvania. Class M license. An individual must obtain a Class M (Motorcycle) license to lawfully operate a motorcycle. This requires the person to pass a knowledge test and ride with a learner’s permit for one year. Riders under the age of 18 must have learner’s permits for at least six months, and have 65 supervised hours of riding time, before the skills test. Seating safety. Motorcyclists and their passengers must sit on permanently attached seats, and each has footrests. Passengers may only sit behind the operator while the vehicle is in motion. Riders must be able to use both hands to control the motorcycle, and cannot be holding anything that compromises this ability. Equipment requirements. Handlebars cannot exceed shoulder height. The motorcycle must have a red light to the rear and a working headlight. All motorcycle equipment must be in proper working condition. Motorcycles must undergo safety inspections annually, based on the month of vehicle registration. Obeying the state’s motorcycle laws can help you prevent a collision. It can also keep you out of legal trouble, avoiding traffic citations and fines. Following the rules makes Philadelphia’s roads safer for everyone. If a driver infringes upon a motorcyclist’s rights to the road and causes an accident, that driver could be liable for damages. Learn more by speaking with a motorcycle accident lawyer in Philadelphia. Pennsylvania law requires all motorcyclists under the age of 21 to wear helmets. This includes both operators and riders. If the person is over 21 years of age, he or she must still wear a helmet until the rider has at least two years of riding experience or completes an approved motorcycle safety course. The only type of rider exempt from the state’s helmet law is someone riding in an enclosed cab of a three-wheeled motorcycle. To meet the guidelines of a federally approved helmet, the helmet must have a DOT sticker. The main cause of motorcycle accidents in Philadelphia is human error. Mistakes and negligence from a driver, motorcyclist, part manufacturer, construction zone manager, and other parties can cause deadly collisions. It is up to the injured motorcyclist in a case (or his or her Philadelphia motorcycle accident attorney) to identify the at-fault party and prove fault during a claim. Some of the most common causes of motorcycle accidents are as follows. Many cases involve more than one injury cause and potential defendant. For example, a vehicle driver may have caused a motorcycle accident through an act of negligence, but a part manufacturer could share the blame for creating defective motorcycle brakes. In these cases, all parties at-fault for the crash could be jointly and severally liable for damages. This could result in greater compensation for the victim. Hiring a lawyer can simplify complex legal processes in Philadelphia. 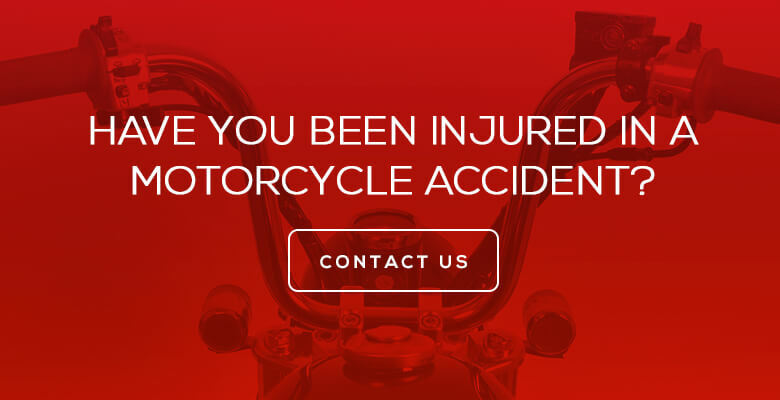 Identifying the at-fault party, choosing which legal route to take, finding high-quality medical care, paying medical bills, and fighting for fair compensation can all become easier with help from an experienced motorcycle accident attorney in Philadelphia. Rosenbaum & Associates cares about Pennsylvania’s motorcyclist community. We want to help injured accident victims protect their rights and stand up against negligent drivers. Learn more about your injury case with a free consultation. Contact us today to request yours.